I have a weakness for toys from the early seventies. The boys and I were out sledding in town the other day and decided to pop into one of our favourite thrift stores. They immediately spotted this - Ringa-majigs. It is quite similar to the Ji-Gan-Tiks that I bought years ago at a church rummage sale for W.
This morning we woke up to a winter wonderland. This is what it looks like right now and it is still coming down like crazy. 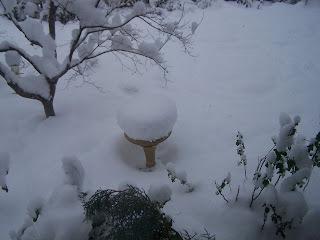 You can see how high the snow is piled on our birdbath. I had to post a picture for Katherine so she could see that, as much as I like to tease her about our good weather, we are actually under a pile of snow right now too. Wow. Those ringa majigs brought back some memories. 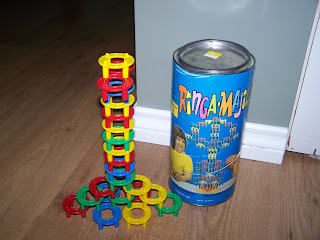 My grandmother, mother of 13, had these for us to play with when we visited. I never knew what they were called. 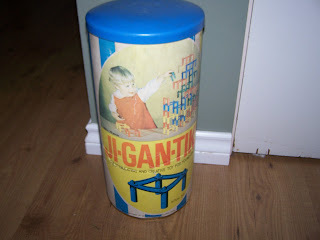 There were so many of us grandchildren that the original container had long since disappeared. Do you think all that snow is some form of Karmaic payback for all the teasing you've given me about moving to the land of the cold and snow????? ;o) It's looking like you have more snow than we do. Happy shovelling.